When Zack and I were in our MBA program, one of our teachers mentored us. So our teacher bought himself a phat (ginormous) mansion on Newport Beach, but it was a bit dated. He was able to use my product for several applications, but one of them was this rad ceiling. This tutorial is to help you turn an existing wood wall or ceiling into a weathered looking one. If you need instructions on applying wood to a wall or ceiling, check out this tutorial on installing DIY Barnwood Shiplap Wall. 1. [If your wood is brand new, jump to number 2!] On this job, the red cedar ceiling has already stained with a white wash finish, but not a cool 2016 white wash, instead it was a dated 80's white wash. You can check it below. When the wood for this project had an existing finish on it, you should sand or strip it. Either use sand it with a low grit sandpaper like 80 grit and a palm sander. Or you can use a liquid/gel stripper like Citristrip to remove the existing finish. 3. For stain we choose Salvage stain from Weatherwood. This will give you a light weathered look, light grays and warm tones. 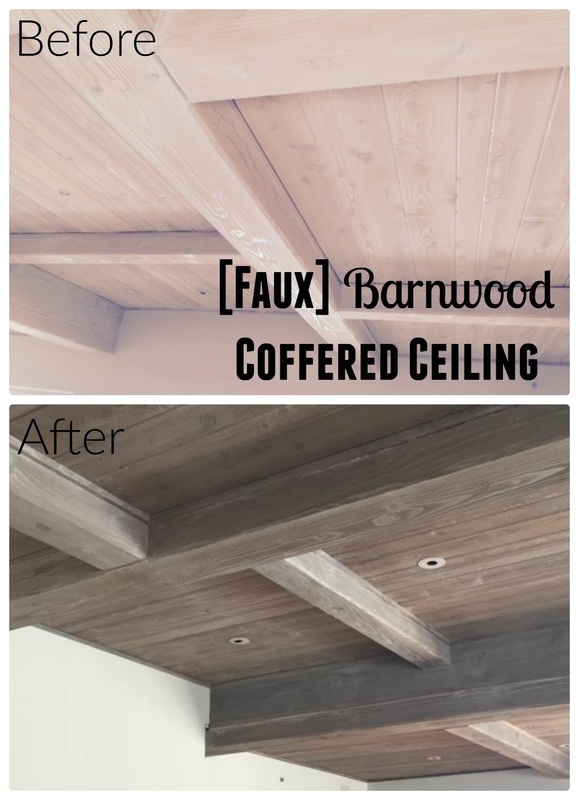 For a ceiling, the wood doesn't need to be top-coated. The wood will dry in about 30 minutes, see in the below video.